Over time the landscape of our neighborhood and community can change dramatically. From new shopping centers to new residential developments, what was once a quiet neighborhood can become a loud, busy and congested area. For some homeowners, the construction of new roadways, stripmalls and housing developments are reason enough to pick up and move, literally. Another cause for concern is when your home is at risk of flooding or being completely demolished by coastline storm systems. While, homeowners can opt to raise their home to avoid flooding, it may not be enough to protect the home from super storms like Hurricane Sandy. For these reasons homeowners are opting to move their home to higher and drier ground. In some cases, homeowners simply want more land to either expand or to get away from their packed neighborhood. Homeowners may feel that moving their structure is a better option for them and their family than building something new or buying a home in a location that they want. Why not move into a new home? So, why aren’t these homeowners saying goodbye to their homes and moving into something new? Well there are several reasons that homeowners may not want to say goodbye to their houses. 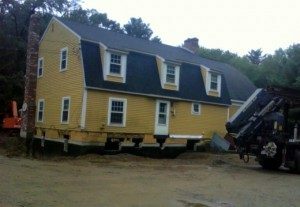 First, many historic homes are saved from demolition by being moved to a new location. In addition, homeowners that are facing the threat of demolition will likely have to pay and moving the structure allows these homeowners to avoid the cost of razing their home. Also, homes that are located in a flood zone and are at risk of damage may be difficult to sell. Finally, many homeowners love the houses that they’re in, they are just dissatisfied with the location and for some the best solution is to move the home. At Payne Construction Services, we know exactly how to safely and carefully transport your structure with minimal damage. If you’re interested in talking over the options and learning more about our building moving process, give us a call or click here for a custom quote.